[Business] Closed until further notice. 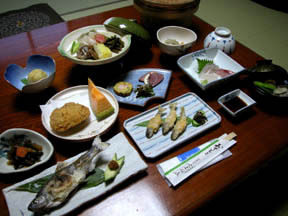 First of all, the meal of the blessing of a rich mountain is recommended in the isolated lodge of the quiet riverside in about 10 K and South Hokkaido about an eruption bay and the prefectural road which falls out from Yakumo to the Sea of Japan.The wild grass and delicacy which the husband of the natural group who goes out also for hunting or mountain stream fishing takes in a mountain meet with the fresh delicacies from the sea of an eruption bay, and it can enjoy the original dish unique to this inn.The palatability which carries out the everybody receptacle of the gold fly of a trout, and a wild grass Oboko-Nabe have [ that it is easy to be in the broth rainy season spent thinly ] the Shaki Shaki bracken, a mushroom, and a clever scallop.also like the vinegared of Aralia cordata and a sea squirt and a crab shell has the good affinity of a wild banboo sprout, and a crab and an egg -- the tea cloth of a potato -- as for an iris diaphragm, the flavor of Petasites japonicus rises.Finally, the husband obtained specially the Large type trout of having raised last week, to the dish, and was impressed by the natural palatability.The hot spring free-flowing hot-spring water of the genuine article of a nothing but hot spring was enjoyed for the quiet inn surrounded by the Structured, the mountain, and the river in Heisei 3, and the clear stream in the open-air bath of the good-location-to-see hand structure. 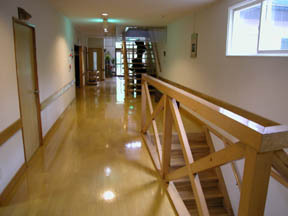 It is feeling-of-purity enough inside of a hall widely. Wild grass and river fish, delicacies-from-the-sea fresh slices of raw fish. Wild grass (Petasites japonicus the inside of an ascetic's-Gyo-jya garlic April - - wild banboo sprout, Petasites japonicus, - Pteridium aquilinum Aralia cordata Ms. mushroom), the eruption bay delicacies from the sea (a scallop botan shrimp SOI Pleurogrammus azonus crab flatfish right-eyed flounder, an octopus, etc.) 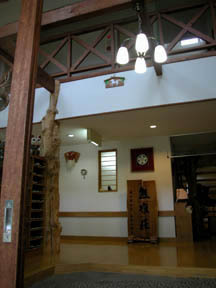 of the Yakumo fishing port landing, a delicacy (a deer, duck, and bear). 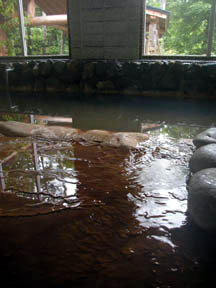 Precipitation of the hot spring which covers the first page of a washing place bathtub. 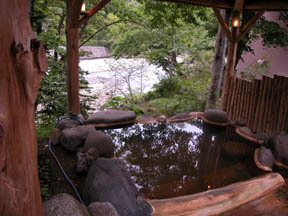 They are open-air bath juxtaposition and 21:00 man-and-woman exchange to a men's section of a bathhouse. 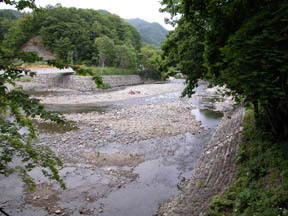 * If the whom who which carries out charter mixed bathing also has a cross-over car visible to ... and the opposite shore in a bridge when it can go to the open-air bath via a men's section of a bathhouse and has become empty from the woman side, let's return. * As for an inn, please consult about the day as for which man-and-woman exchange is vacant not only in the above-mentioned time to whom who. The Nodaoi station and a limited express are the Yakumo stations. 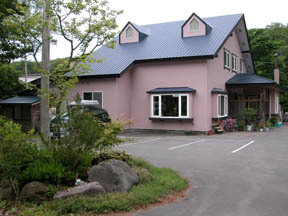 To the Nodaoi station, the Yakumo station is based on a congestion situation.